Removes high volume items from the soil belt and delivers directly to the wash slings, reducing labor costs. When two or more items make up 50% (or more) of the soiled linen volume, it is more efficient for these items to be taken off the soil sorting conveyor belt and to be dumped directly into a sling. Valuable plant floor space is saved and typically the need for one or two belt-sorting operators is eliminated. The soiled goods conveyor belt does not stop as frequently, thus increasing production. Typically a third tube is added to each counting workstation table. 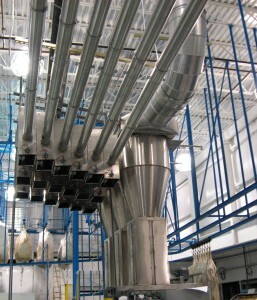 The tubes from each table can feed any number of bins each dedicated to a wash classification. The system is based upon the “dry weight” concept for efficiently loading the wash wheel.